BIS Research estimates the global blockchain healthcare market will reach $5.61 billion by 2025. Here’s a look at how blockchain is transforming healthcare. When most people hear the word “blockchain,” more often than not they associate it with cryptocurrencies like bitcoin. The use of the technology itself, however, is being explored across a wide range of global supply chains — including the healthcare industry. Blockchain is defined as a digital ledger in which transactions made are recorded chronologically and publicly. Deloitte describes blockchain as a “shared, immutable record of peer-to-peer transactions blocks and stored in a digital ledger.” There is no central authority in a blockchain system, meaning all transactions and records are stored and shared across all network participants. When it comes to the healthcare industry and keeping patient information secure, blockchain can provide a safe and accessible way to retrieve information without processing it through various institutions. In terms of the current state of blockchain in the healthcare industry, a BIS Research report estimates that it will be worth $176.8 million this year, and will reach $5.61 billion by the end of 2025. With blockchain fueling so much growth into the healthcare sector, here the Investing News Network takes a look at how pivotal this new form of technology will be in this industry moving forward. As it currently stands, the blockchain healthcare industry role is relatively small, although that’s expected to change. Data from Statista.com shows that in 2017, 50 percent of healthcare applications weren’t sure or didn’t have any plans to adopt blockchain across their platforms, with only 15 percent stating their intent to adopt blockchain for commercial deployment. Research from IBM (NYSE:IBM) shows that the company surveyed 200 healthcare executives in late 2017 and found that only 16 percent of respondents expected to have a blockchain solution at hand sometime before the end of last year. On the other hand, Deloitte projects a more aggressive increase in 2018 for the healthcare industry in establishing blockchain technology. According to the firm, 35 percent of healthcare and life science respondents plan to implement blockchain at their companies sometime in 2018. With the healthcare industry continually adopting blockchain, it’s important to look at what ailments the industry is currently facing, and the benefits blockchain can bring to the table. BIS Research indicates that the exchange of health information may be critical when it comes to controlling the rising costs of healthcare and “promoting quality care.” The firm states that the quantity of information that’s shared amongst hospitals, physicians, institutions and others is still minimal. That said, while the invention of Electronic Health Records (EHRs) makes it easy to share data within organizations, the software for inter-organizational EHR platforms has yet to be implemented. What’s more, there is minimal standardization across EHR software because EHRs in different vendors and countries vary when it comes to technical standards. In short, there are growing concerns about security and privacy of data, particularly as a result of data breaches and malicious attacks on healthcare organizations. This is where the blockchain healthcare industry role steps in. BIS Research states that blockchain can play a “critical role” when it comes to the shortcomings and challenges as it relates to legacy systems. Some of the advantages blockchain technology can have in the healthcare industry include: creating transparency, eliminating third-party intermediaries, streamlining operational processes and curbing large costs. As it currently stands, BIS Research indicates that a number of healthcare institutions have already reported successful uses of blockchain technology ranging from: consent tracking in clinical trials, a healthcare information platform by Medicalchain and a pharma supply chain solution. What’s more, the use of blockchain technology could save the industry roughly $100 billion per year by 2025 in data breach-related costs, IT costs, operations costs, support function costs and personnel costs. BIS Research estimates that blockchain in healthcare will reach over $5.6 billion by 2025, and some of the biggest beneficiaries of this technology will be pharmaceutical companies, which lose an estimated $200 billion to counterfeit drugs each year. The use of blockchain will enable complete transparency and visibility through the drug supply chain, which will track drugs to the point of origin in addition to minimizing falsified medication. Clinical trials, cold chain monitoring and prescription drugs tracking are also expected to experience drastic savings thanks to blockchain’s role in the healthcare industry. Meanwhile, the application of blockchain in health insurance is projected to grow at a CAGR of 70.2 percent over that same period. Much of that growth will come from the use of blockchain to minimize IT and operational costs and to reduce healthcare-related fraud. Blockchain investors can take comfort in knowing that the technology itself is far from going away. While blockchain is largely associated with cryptocurrencies, the technology behind it is making a name for itself across a wide range of platforms, with the healthcare industry at the forefront. 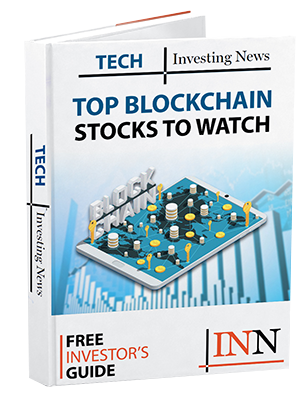 As a result, there is no shortage of blockchain technology stocks for investor consideration. While these companies may not directly be involved in blockchain’s role in the healthcare industry, with the amount of money going into the global blockchain healthcare market, more publicly traded blockchain companies will be looking to find their places in that growing industry.